If you love bright and fresh home interiors, then you'll love this small Spanish apartment—it simply pops with colour! Spanish interior architects, Studiobmk, have pulled off this effect by creating a unique combination of bright colourful prints, patterns and tones against a neutral base. This is a home that could serve as a very useful guide for someone learning how to create bright splashes of colour in the home. The white and turquoise has an impossibly fresh and clean appeal. 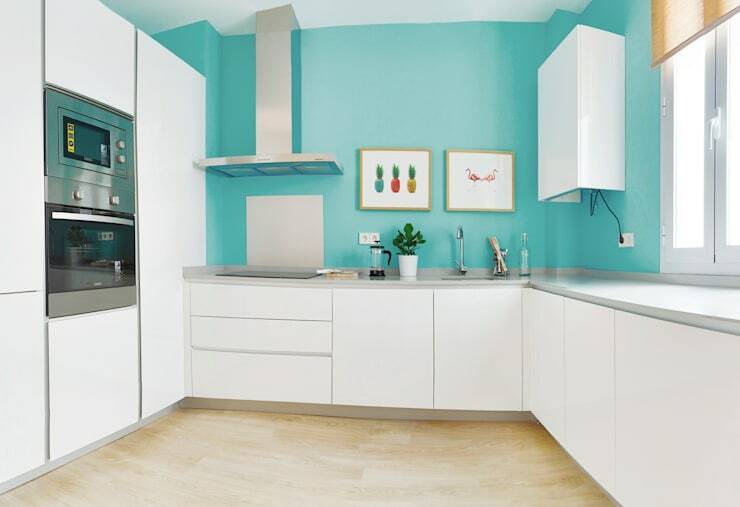 The kitchen is surprisingly big for a one-bedroom apartment and the sense of spaciousness is further accentuated by the lack of wall cupboards. This helps create an open, free-flow of energy. This shade of turquoise also makes a rather strong style statement, so it's fitting that the other elements provide a quieter counterpoint. In particular, we are referring to the white handleless and minimalist kitchen cupboards. The main living room/dining room contains large French doors that provide the main source of natural light in the home. This light also pools over into the bedroom accessed through the wide doorway to the left. All living areas are gently connected through a neutral white base. The furniture is built in the Scandinavian style and there is an eclectic combination of shapes and lines in each piece. 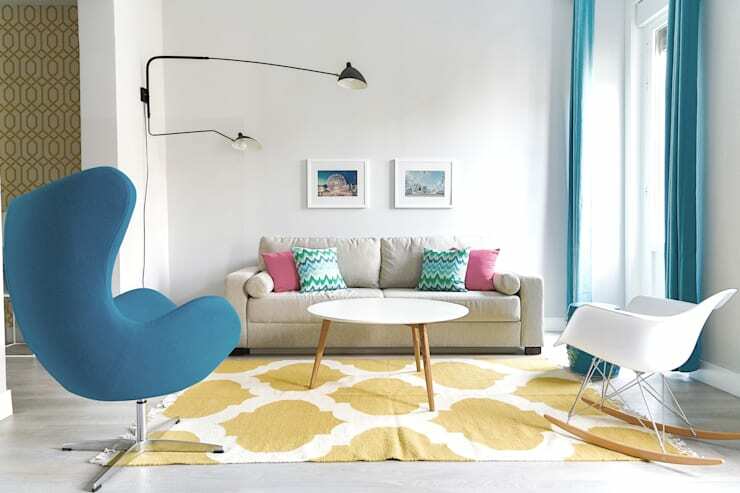 The splashes of colour are artfully chosen so as to create a sense of cohesion in the home. The yellow carpet links to the yellow of the bedroom wallpaper and the blue chair links to the window drapes. 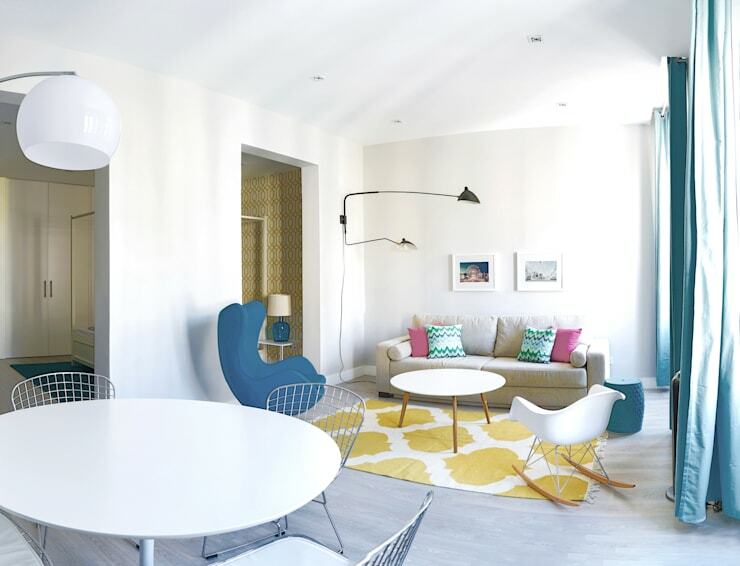 Note how the larger pieces of furniture in the home are neutrally coloured and it's generally only the smallest pieces that have smaller bursts of colour. 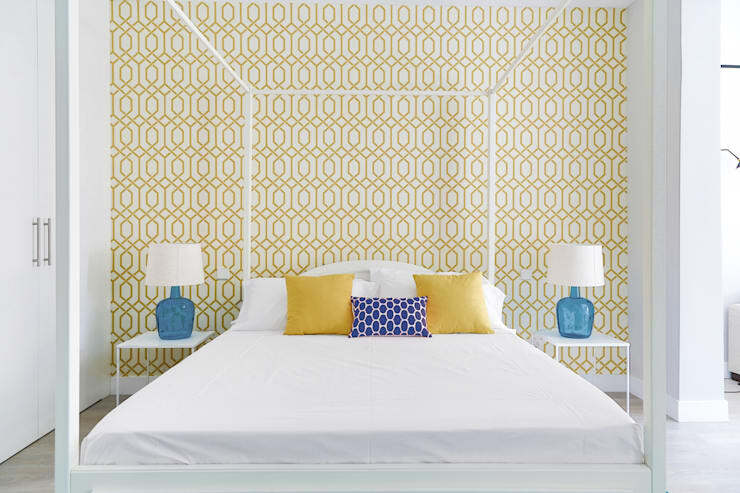 One of our favourite features has to be the gold geometric wallpaper in the bedroom. It has a classic 20th-century design and the fine lines of the pattern give the bedroom an extra level of sophistication. The four poster bed design also gives a sense of modern grandeur to the small bedroom. Note the fine lines of the frame and how they serve to lighten the visual weight of a more classic four-poster bed design. A black bathroom is definitely different. As we can see here, a black bathroom tile doesn't necessarily have to make the bathroom feel dim or dark. 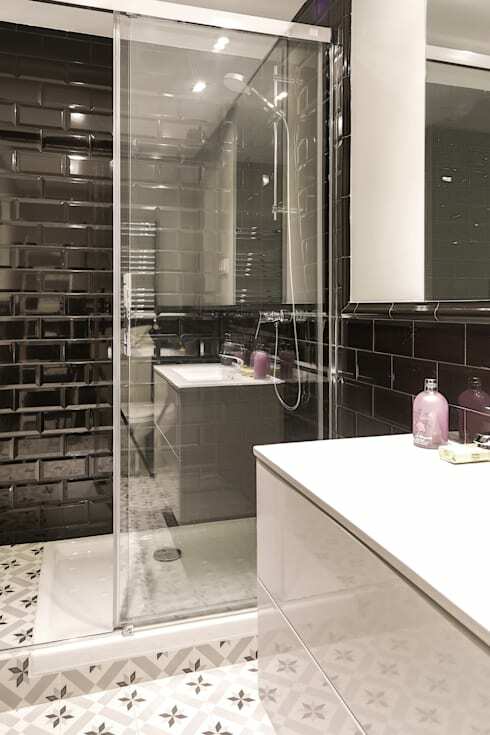 The secret to making a dark bathroom work is incorporating lots of highly reflective surfaces. Combine this with a transparent shower room and a large frameless mirror are you have a successful bathroom decor like this. 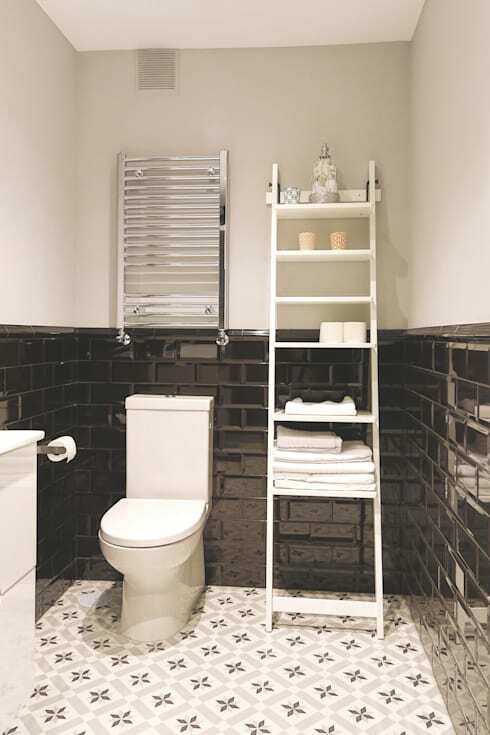 The bathroom has a great little white ladder for added convenience and storage. It also has a fairly interesting classic floral floor tile. This is not a tile you might expect from a fairly modern flat. Here, it works because the white diamond pattern has lots of cool grey areas that create a link with the black of the wall tiles. For more small home ideas, have a look at 7 genius ways to divide your home without walls.